The Chuck Roast is a cross section of the center chuck, and an amazing pot roast! Essentially the cow’s shoulder, the Beef Chuck is a large network of strong muscles that steer and maneuver the majority of the animals weight. These hard working muscles are generally not tender enough to grill, but thanks to their generous marbling and collagenous connective tissue, they’re the best tasting of beef’s cuts and a fabulous value! 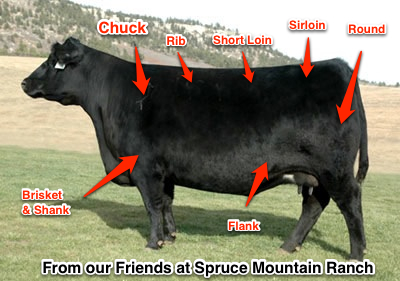 A champion Angus from Spruce Mountain Ranch in Larkspur, CO.
Chuck Cubes make great braises and soups. 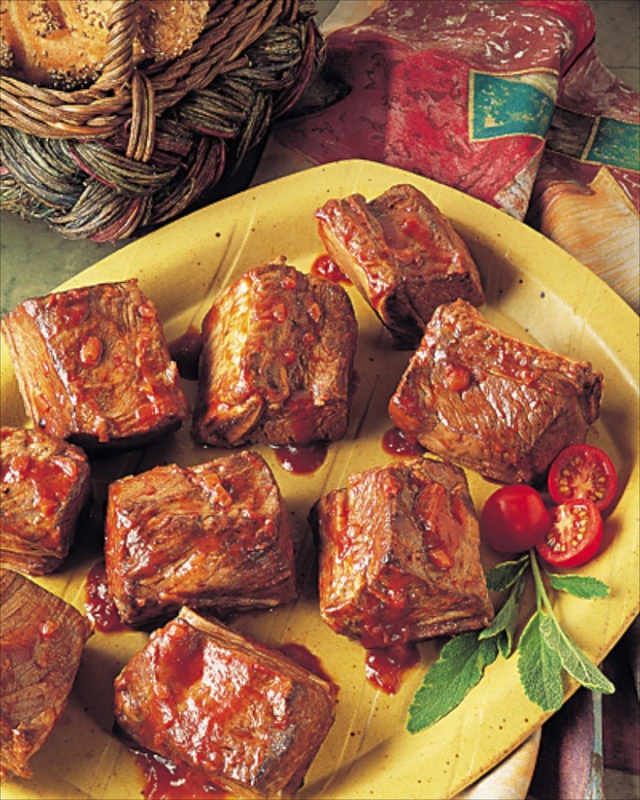 The trick is slow braising (AKA pot roasting, slow cooking with liquid and a lid), which breaks down the collagen and renders these tough, hard working muscles into tender and delectable shreds and jus. oven at 225-300° – or simmer as slowly as possible on top of the stove. Cook until falling apart tender, generally about 3-5 hours. There are more cuts from the shoulder than I can list here, but here are some of the most popular along with links to recipes. Beef Stew, or for making a meaty pot of Chili. 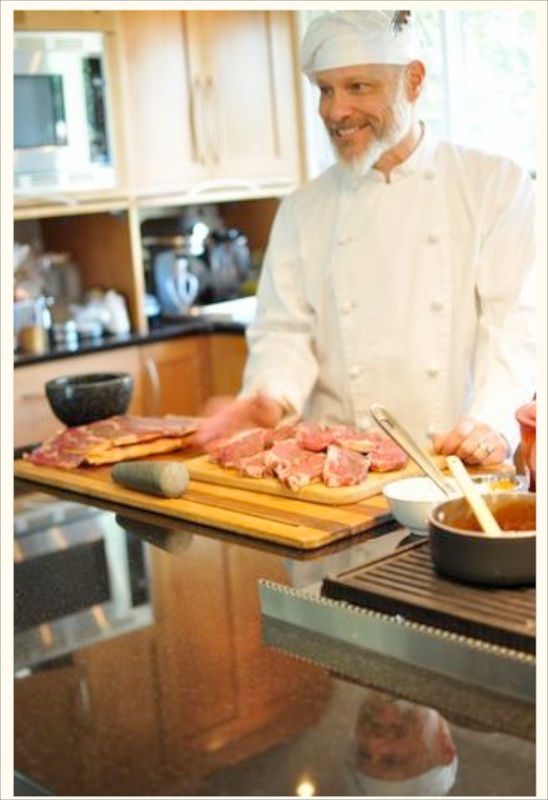 The Chuck Eye Steak is great on the grill! Hiding within the chuck are a few small cuts that don’t have to work hard, so they’re tender enough to cook like a steak. They are not very big, and tricky to butcher, but we extract them and offer them in our selection of High Value Steaks. 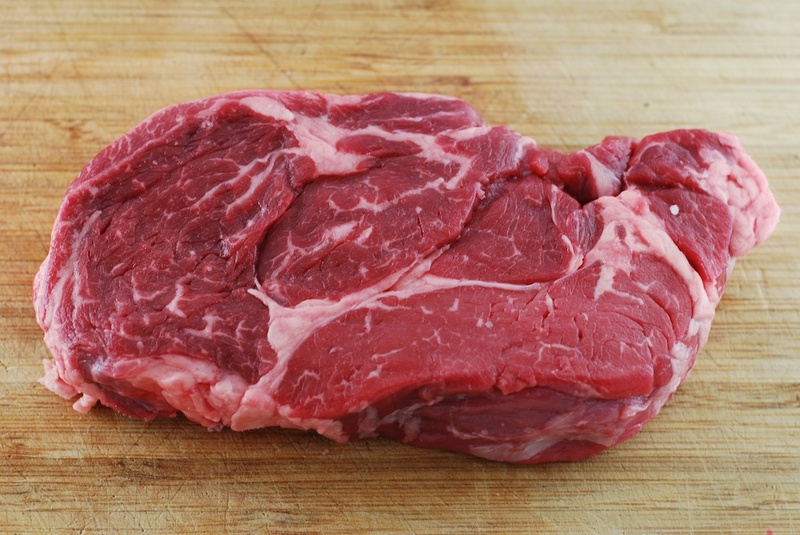 My favorite steak from the shoulder is the Chuck Eye, followed by the Chuck Tender, Flat Iron and finally the Sierra Cut – learn more about these and other less known steaks here. Thanks for reading, next week I’ll cover the Beef Round or hind leg to complete this series. Please subscribe and forward this to your food loving friends – Buon Appetito – Salute!